Thank you for the kind comments on my last post…and for continuing to read and visit this blog! In between Summer whizzing by, I’ve managed a tiny bit of sewing. I finished this quilt last week and it went straight to the top of my favorites I’ve made this year. I used the Scout pattern in the Crib Size, which is still a generous 49″ x 52″. The pattern only calls for 10 cuts of fabric for the columns, but I cut the strips from 14 or 15 different solids. I also substituted the neutral background fabric for this older Leah Duncan floral print I used on this quilt. Despite looking like a hard quilt to make, this actually goes together easily with strip piecing. As I was making it, I was trying to remember how on earth I figured out this pattern in the first place..I must have been smarter back then! I didn’t want to cover the solid fabrics in quilting, so I stitched in the ditch (here is a video if you are new to stitching in the ditch!). I’m not great at stitching in the ditch, but I used an aqua thread that hides fairly well on most of the solids. It still looks good despite me “jumping out of the ditch” on most of it! The PDF version of the Scout pattern can be found here, the Paper version can be found here. ps. If you want to see a version of this quilt without the sashing strips…here is one I made years ago that is still a favorite. Also here are photos of the throw size pattern version. Happy Scouting! Thank you! I love her prints! What a fun quilt! Adding the print to those lovely solids really ups the charm factor. 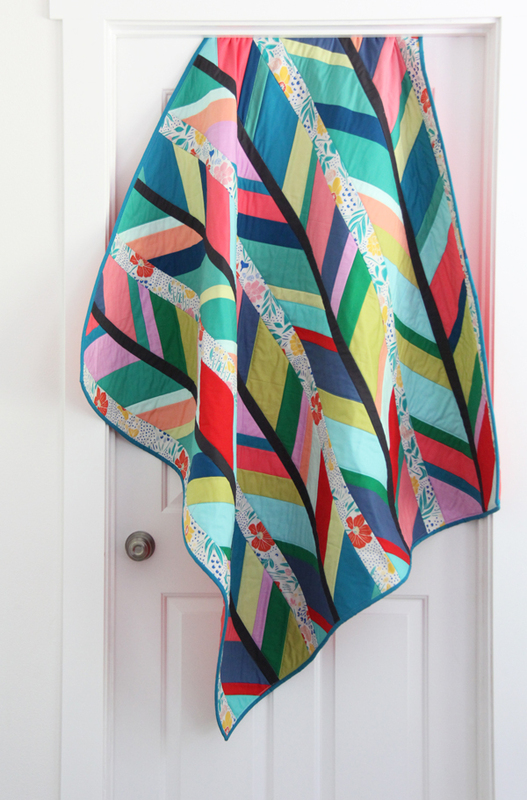 Oh my goodness do I love this quilt! So modern with just a hint of the traditional with that fun floral. It’s definitely a happy quilt! This is stunning, Allison. I love the contrast and addition of black and that sweet floral. I have several of your patterns and appreciate how detailed they are. Bless your Buttons. Haha! I made the quilt for the pattern cover in more fall-ish colors. It’s beautiful in anything! It’s certainly a pretty one! Thank you for sharing such a nice idea. This looks so pretty and beautiful.